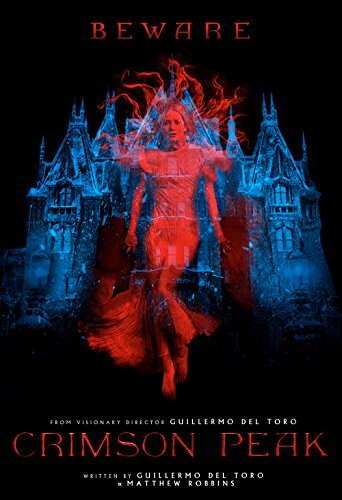 Buy Crimson Peak cheaply from Amazon. You too can earn money from writing articles by signing up for InfoBarrel. Crimson Peak opens with an Edith Cushing (Mia Wasikowska, Stoker) that is rather the worse for wear, with physical damage and quite a bit of blood on her, standing against a snowy background. She is recollecting that ghosts are real, because she saw one when she was ten years old, that of her recently deceased mother, who was warning her about Crimson Peak, a warning that means absolutely nothing to her at the time. Fourteen years after that - the date is never explicitly stated, but it's either the end of the nineteenth or the beginning of the twentieth century - an adult Edith, who lives in Buffalo, New York, is trying to become a published author, but is facing problems. She's written a story about a ghost, but the publisher she sees thinks she should instead write a love story, probably because she's female. Credit: https://en.wikipedia.org/wiki/File:Crimson_Peak_theatrical_poster.jpgEdith's father, Carter (Jim Beaver), is a wealthy self-made man. He, and some associates, are being approached for some start-up capital by impoverished English baronet Thomas Sharpe (Tom Hiddleston, The Avengers, Thor: The Dark World) - presumably an old baronetcy, because baronet is a title that was intended to be sold to people who had money but no title - who has designed an engine for mining the red clay that his ancestral seat stands on, a clay that is very suited to making bricks. Mining the clay in recent years has become difficult, and the family has no money, so Sir Thomas, and his sister, Lady Lucille (Jessica Chastain, Mama, The Martian), have been travelling to many places trying to raise funds. Edith becomes struck on Sir Thomas, but her father doesn't trust him, although he isn't sure why. Part of his dislike is because of Sir Thomas' title which contrasts quite strongly with Carter's progress from manual worker. She marries Sir Thomas and travels to the mouldering ancestral seat of Allerdale Hall in Cumberland, although it seems that Thomas isn't marrying purely for love, but to gain access to her money, but as the film progresses, it seems he does have some actual feelings for Edith. His sister, Lucille, also seems a little - strange, and maybe a little unbalanced and potentially threatening. In the house, Edith starts seeing other apparitions, who on occasion also seem threatening, but may also be trying to warn her about something, such as how, and why, they died. Finding out what is truly going on is going to be dangerous. Back in the United States, Dr. Alan Michael (Charlie Hunnam), and old friend of Edith's, also suspects there is something happening, and is concerned about her safety. Allerdale Hall is a lovely Gothic monstrosity, with dark, spiky turrets and woodwork, although it doesn't seem to be quite as badly damaged on the interior as it should be, given that there are gaping holes in the roof letting in rain, snow, and leaves from some unknown source, given that the area is rather short on trees. Which should also make it pretty much uninhabitable in winter, even if you have a large fire in every room - and is contradicted by the claim that the house is sealed with the windows shut. The red clay, which is seeping up out of the ground, gives the excuse to make the snow look like it's covered in blood, have vats apparently filled with gelatinous blood and to make red water come out of the pipes, also resembling blood, although it's taken a bit past subtle. If there is one serious problem with the film, it is that it doesn't seem to really know what type of horror film it is; instead, it's a mashup of many different types. With the ghosts - most of which are basically skeletal, and there doesn't seem to be a genuine reason why some of them are - there is an element of supernatural horror, but this is more modern in-your-face supernatural horror than the, often more subtle, Gothic horror that might have been expected from the setting. There are also thriller elements to it, with the actual main plot, and there's also rather a lot of gore that clashes with the feel of some of the film. Overall, you are left with the feeling that if they'd simply picked one type of horror and stuck to it, it would have turned out better. As it is, it's a bit of a mish-mash where it seems the creators wanted to include every different type, and the romantic elements don't help with the coherency either. The scenery and locations of Crimson Peak are often visually striking, and the acting of the main characters - Dr. Michael is a minor one and less than brilliant, as he's sort of a non-entity - is decent enough, but they seem to be working around a film that hasn't truly decided what it wants to be.